VA loans are a great option if you’re Active Duty Military or a Veteran looking to purchase your dream home, pay off debts on your current home, make improvements, or just reduce your monthly payments and lower your interest rates. 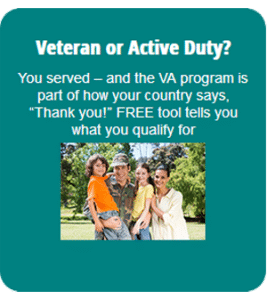 There are several ways you could be eligible for VA financing. The most common way is 2 years active duty, or 6 years in the Reserves/National Guard. We’ve been able to help a lot of people who thought or had been told that they didn’t qualify, so if you have any questions, call us at 360-676-9600. Honorable discharge 90 days or more, any part of which occurred during wartime, or 181 continuous days or more (peacetime). You are the surviving spouse of a Veteran who died during service or service-related injuries and are not remarried. Credit. Many veterans have not established traditional credit scores by taking out loans and paying them back, or by using credit cards. Fortunately, the VA program’s flexibility allows us to prove your creditworthiness without having a traditional credit score. In addition, people with low credit scores may still be able to qualify. Income. Other loan programs use “debt-to-income ratios” in qualifying people for financing. Contrarily, the VA program uses a different method that takes your net income and your family size (Residual Income) into consideration. For smaller families, calculating income this way can allow you to qualify for VA financing even if other lenders have turned you down because of a high debt-to-income ratio. As you can see, there are many reasons why it makes sense to consider a VA home loan. We are grateful for all of the Veterans and military personnel who have served our country. In return, we hope to help you find and keep the home of your dreams. Would a VA loan be the right choice for you? We can help you understand your options and choose the loan program that best meets your needs and your financial goals. To see if you qualify, you can complete our simplified intake form here, or call the The Bjornson Team at 360-676-9600 for more information on VA home loans in Bellingham.